These Casino Quality Phoenix Decks - produced at the US Playing Card Company - are cut one millimeter shorter than a standard Poker Size Deck. And to make this even more devious, we altered the art work to eliminate the tell-tale narrow border. These decks have a multitude of uses; in fact a chapter in The Encyclopedia of Card Tricks has been designated to The Short Card. Insert a regular Poker Size card into a short deck and you immediately have a deck with a long key card or place a short card in a regular deck and you have a short key card. 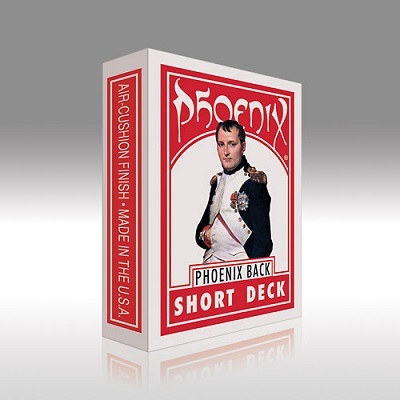 If you combine a Short Deck with a Regular Phoenix Poker Deck, you now have two Mene-Tekel Decks that are "Long and Short". These are the same cards that we use to produce our "Casino Quality" Phoenix Svengali Decks.